Padubidri, Feb 26, 2017: Hundreds of activists of the Hindu Jagarana Vedike staged a protest in front of the Padubidri police station till midnight on February 25, Saturday demanding the arrest of a group of youth belonging to another community who allegedly assaulted the driver and cleaner of a lorry by dragging them out of their vehicle near Mudarangadi masjid. Though the protestors were adamant that they would not move from the place until their demand was met, they withdrew their protest after the police showed records of registering FIR against the accused. It is learnt that a lorry which was transporting rice from Sastan was intercepted by two bike riders on Mudarangady road on the pretext that the lorry driver had used loud horns to give way for the vehicle. The duo had then reportedly assaulted the driver and cleaner. Three more had joined the assailants later, it is alleged. As a large crowd gathered, one of the accused had reportedly used abusive words further aggravating the situation. 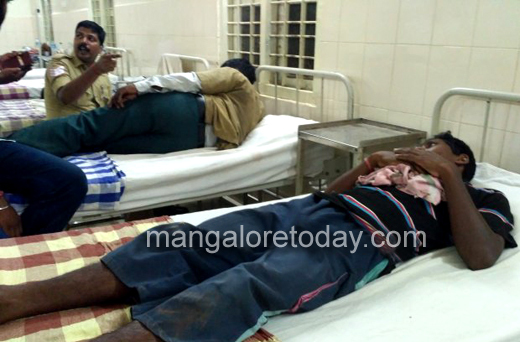 The injured Bhasker (38) and Shanker (35) have been admitted to Udupi Government Hospital. 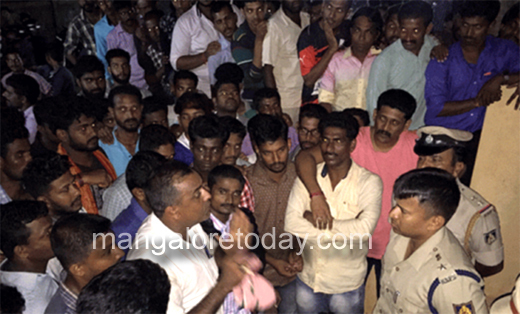 Udupi’s in-charge SP Vishnuvardhan has said that a special team would be formed to nab the assailants. The police are also considering whether to file complaint against those who picketed the station on Saturday night and tried to create disturbance. These are just some reasons , patience is very important . Never lose temper for silly reasons. And it you people who are making the situation worse by bringing community i between.